Love it, Good to hear it's lighter mine is so heavy I am not using as much I as would...I should exchnage it for this one because it is sooooo cute !!!!!! Thanks Carly - it really fits a lot of stuff...i guess it's kind of a midi bag...not too big and not too small. Yay! OMG I would love to see the bigger version - do you have a pic? Weeps with envy! Such a beautiful shade! I love the outfit pairing! On the scab front, been there, it happened to be on the week I was meeting new friends, they later said they thought I was odd, not from having a burn scar across my forehead but purely because of the way I was acting, talking to them with my head facing away. ah i can relate. I have definitely tilted my head a particular way during conversation so that people cannot see the burn but i probably only ended up looking like a weirdo with a contorted neck. i am fooling nobody. Thank god it is flaking away and leaving a scar - a scar I can deal with! That bag is to die for Laura! I think I prefer it over the rocco, although not sure why. I just love that color - greige at it's finest! Ah the Focco! I used my black one until it fell apart :) now THAT was a good purchase! I saw the title to this and I immediately thought "She didn't!". It's so cute I can't cope. Well jel to the highest degree. Sooo in love with the bag...may just have to get one! Love you bag...swoon! Gorgeous rich, berry colour. PS. Now following :) Should have officially done this a long time ago as I always see you comment :) Thanks Adele! Yeah I needed to slap on some heavy duty E45 but have had to just wait it out as it flakes off. Learned my lesson not to pick spot and then use acid based product though! Pregnant and therefore chubby lol so I'm with you on the vain front ! I definitely NEED this bag. It's just too irrestible! Highly recommend the Wang bags. They are such nice quality and although the style has been copied they still definitely feel special :) Thanks Beth! I wish I owned your handbag collection. Oh, yes I have a lovely red spot on my nose and I'm not touching it. Concealer is working, just fine. Absolutely, love the hand bag. The size is perfect! I am in love with the Rockie! It's so diddy, I may have been actually sad enough to have sighed at the sight of it! I love your bag!!! So perfect! Great outfit! Oh my god that bag is beautiful, serious bag envy! Gorgeous bag! I actually bought my first Alexander Wang purchase this weekend in the Black Friday sale. I purchased the Darcy hobo in Birchwood, which somehow feels a little lighter. The leather feels buttery soft! They just feel so substantial! The more I see that top, the more I want it. I need to get on it while they still have my size in stock and as for the Rockie, so cute. I *nearly* brought the Rocco when you facebooked the discount code. Obviously now I've seen the Rockie, I'm going to be spoilt for choice next time there is a Wang sale on somewhere. Great look and beautiful bag! Love it! OMG can that bag just appear in our closet already? It's fabulous!!! plus your white blouse is gorgeous! we're suckers for a unique white blouse . . . . I define this cute too. Lovely blouse. The folds are interesting. Aww look at that tiny Wang! Beautiful bag! Great choice - what a dangerous email to be sent by Shopbop! I was prepared for cute but that is a really really cute bag. Loving the jeans but I've experienced really bad fading of colour from Topshop jeans before. Ouch! I just did something very similar with my own face, and it is KILLING me, because I have so many things lined up for this week. I thought that if I picked the blemish and then put a ton of acne-fighting medication on it my skin would clear up in time. No. No, my skin has not cleared up and in fact looks 10,000 times worse because it is not only a red lump, but dry and irritated as well. Best of luck as far as healing goes! Your top is so cute and I adore your bag! Everyone loves a bit of Alexander Wang! I have his Emile tote and can't get enough of it! That's horrible to hear about your skin reaction :( I'm glad it's getting better though! Really love your cute bag. I hope you feel better now. A great purchase always cheers me up! i feel your pain with the scabby face. my face reacts like that with bezoyl peroxide. i recently discovered sisley express flower gel. i slather it on over night, and use it on my scabby bits during the day under makeup. works wonders. this time i only had scabby face for 2 days instead of over a week. 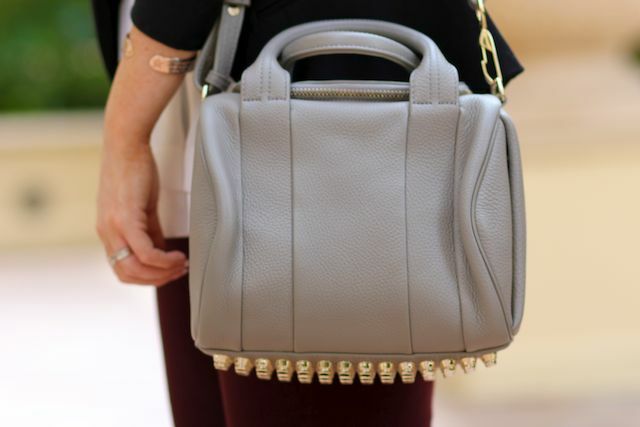 Love this bag and your style is always impeccable! I love this bag, it's so cute! I love the detailing on the bottom. I've tried on the Rockie in Cayenne before, but the Oyster colour has such smooth leather! You look amazing as always. Love the bag! I literally 'aww'd when I saw this bag, it's so cute! Uhh I love your top! I love the top and the color of the bag is amazing! where did you get that bracelet? It looks like a rose gold cuff with something engraved on it? You could duplicate the above procedure to include even more youngsters to your account. ParentPay Log In ParentPay holds a repayment background for you to examine any time. I agree with you. Thanks for sharing such kind of informative and helpful article.